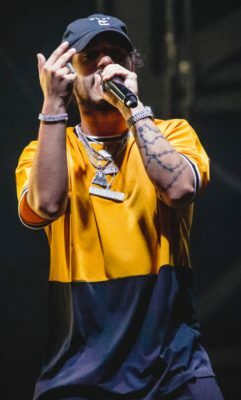 Russell Vitale, known to the rap world as Russ, sling-shot to the top of the Billboard Hot 100 charts in 2016 with his debut single “What They Want,” followed by “Losin Control” in 2017 after a self-made start on SoundCloud. His first album under Columbia Records, “There’s Really a Wolf,” went platinum in April and solidified Russ’ name in the music business. His sophomore album, “Zoo,” released Sept. 7. The lyrics are fueled less by the arrogant attitude that filled his previous album and singles, and more by his anger at the outpouring of hate he has received from fans of the rap community. In “Kill Them All,” Russ calls out “… clickbait-a– journalists and s— …” in his spoken word intro, claiming that he’s “… on some kill everybody s—, f— y’all.” Russ’ hatred is directed toward other rappers as well as the rap fans who have made a game out of critiquing him. In September 2017, Russ posted a photo of himself on Twitter wearing a T-shirt stating, “HOW MUCH XANS AND LEAN DO YOU HAVE TO DO BEFORE YOU REALIZE YOU’RE A F—ING LOSER.” Fans of drug-lauding rapper Lil Pump responded with criticism of Russ, and the image of Russ’ T-shirt turned into a Twitter meme, with users editing the shirt into nonsensical statements. Others criticized Russ for simplifying the complex illness of addiction into a matter of personal choice. But the damage had already been done. Russ garnered a large base of haters who criticized his stance on drugs and addiction as well as his superiority complex as a self-produced musician. “At this point in time, if you mention Russ in a negative fashion on Twitter, you’re bound to get more retweets,” Russ said in an interview with DJ Envy, Angela Yee and Charlamagne Tha God on “The Breakfast Club” radio show. Despite the album’s cocky, unconcerned beginning, Russ’ heavy bass beat tracks and high-energy pump-up songs quickly devolve into slower, more serious beats with a raw edge. In the past, Russ’ music has focused mainly on themes of love and boasts about his money and fame, shying away from deep dives into his personal struggles and the large amount of hate he receives online. In “Zoo,” it’s clear that the negativity is starting to get to him. One of the mid-album songs, “Parkstone Drive,” relies on a gentle guitar melody and the choppy sounds of bongo drums. Here, Russ raps about his struggling relationship with his father and his career burnout. “All this s— been happenin’ while I was blowin’ up / And it’s still going on, now you know what’s up,” he raps, addressing his fans and haters. His pleas of exhaustion continue with “Begging You,” which reiterates much of the same sentiment as the other two serious tracks. The rest of the album isn’t as out-of-character for Russ. In “Our Time,” “From a Distance” and “Missin You Crazy,” Russ returns to his honest and reflective tracks about love. In “Serious,” a synth-heavy song reminiscent of ‘90s rhythm and blues, Russ asks his girlfriend to recognize his commitment to her. The chorus, a repetition of “Baby take me serious,” is indulgent to hear in Russ’ smooth, crooning vocals.